Starbucks' Christmas controversy: Americans indifferent, says online survey | Opinion Outpost ""
News surrounding coffee giant Starbucks and a so-called War on Christmas has dominated headlines in recent days, as critics claim the company's 2015 annual holiday-themed cup is starkly anti-Christmas. The controversy even trickled its way into presidential politics, with Donald Trump weighing in on the situation. According to CNN, Trump said of the dispute, "Maybe we should boycott Starbucks? I don't know. Seriously, I don't care." The presidential hopeful's sentiments echo the anger felt by some, but his apparent apathy toward the situation is a much more popular stance, according to a recent online survey conducted by CNBC. 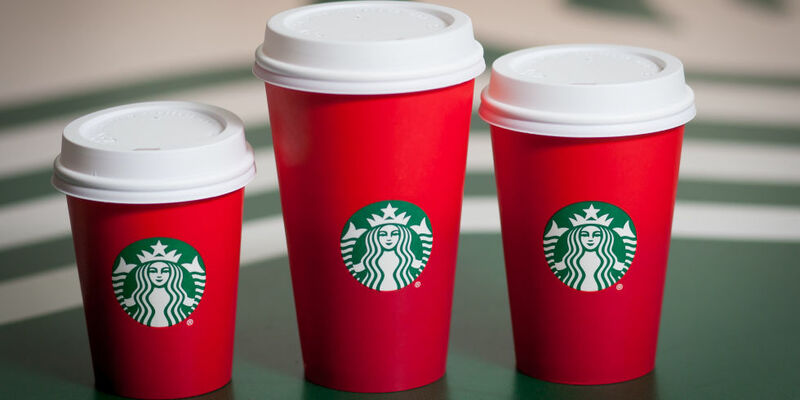 The red and green Holiday cup was intended to be a simplistic take on an annual Starbucks tradition reported CNBC. Since 1997, Starbucks has offered many different design types, featuring anything from simple snowflakes to more Christmas-centric reindeer or ornaments. While not everyone's Christmas season revolves around Starbucks, those claiming this year's simplistic model are a repression of the Christmas spirit took to the Internet to voice their outrage. Most Americans, however, are apparently not particularly offended, according the online survey hosted by CNBC's website. Of 52,872 participants, the most popular answer to the prompt, "What do you think of Starbucks' 2015 red cups" was "I don't care," which earned 61 percent of the vote. Another 25 percent of voters responded with "I like them", and just 11 percent of respondents to the poll stated that they did not like the design, regardless of reasoning. Starbucks offers Christmas gift cards, CDs, and other products specifically geared towards the holiday, suggesting it is not against celebrating Christmas at all. Regardless, the controversy continues to swirl online, especially with Dunkin Donuts releasing its own holiday cup. Long-time rival of Starbucks, the New England-based Dunkin Donuts struck a chord with consumers demanding more Christmas-themed products this Holiday season with its own coffee cup geared towards the Christmas season. Between the red lettering, the cursive "joy" and the wreath, Dunkin's cup outwardly projects Christmas more than it does any other December holiday. In fact, Dunkin Donuts is offering a number of Christmas products this winter, according to a recent press release. While some flavors and products aren't necessarily related to just Christmas, the new cup and special-edition items like the Dunkin Donuts "Ugly Christmas Sweater" seem to be specific to Xmas. Despite the controversy, odds are this was not a direct shot at Starbucks by Dunkin Donuts, even though the companies are direct competitors. Dunkin's has for years used the word "joy" and similar motifs on its holiday cups, and the design and manufacturing of the 2015 version would have taken months to execute. Regardless of any apparent controversy, many people have taken to Twitter to quell the fervor, using the hashtag #ItsJustACup. Regardless of your stance on the entire situation, taking paid surveys is an easy way to make money online from home in order to pay for coffee, donuts or any ugly sweaters this holiday season.